Give your guest bathroom a makeover that will make the rest of your home more vibrant. 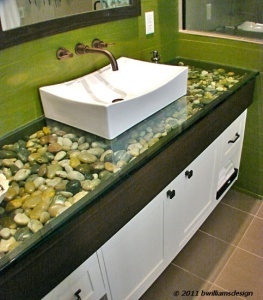 A free standing vanity and trending light fixtures are simple and relatively inexpensive. You can also use a new tank-less toilet and some textured wall tile. We like a trendy European vanity with sink basin and some dark or stained reclaimed wood with angled lighting giving different perspectives in the bathroom. A tile pattern set into the floor or the use of LED lighting, glass and pebbles in a vanity give the bathroom a trendy style and can set the mood for your house guests. Check out our Pinterest page for some cool ideas.